What is "the Oil Catch Tank" ? 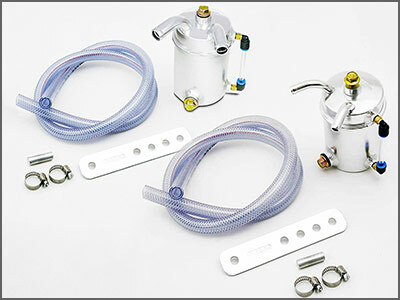 Blow-by gasses are one of the gasses that influence engine performance as miles are added to the vehicle. Theses gasses are re-circulated through Engine intake or Air cleaner for re-burn in order to prevent polluted air to escape. Although gasses are re-circulated for re-burn, not 100% of the re-circulated blow-by gasses and other particles are burned off. Portion of the gasses condensed to sludge or oil with carbon residues. Theses sludge build-up in intake pipes and intake manifold decrease efficiency of the air-intake and reduce power output. This may increase white smoke from exhaust. Oil Catch Tank is installed in re-circulating pipe to collect unwanted sludge and carbon rich oil residues from re-entering intake. Not only for motor sports applications, but also applications for diesel engine vehicles that is high in blow-by gas is recommended. Moreover, if you find lots of oils in catch tank, it indicates problem in Engine. 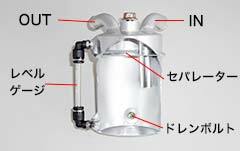 This oil catch tank help detect the problems early stage. Features of "CARBING Oil Catch Tank"
CARBING oil catch tank is compact body (75mm x 135mm) easy to fit design. Both 10mm or 15mm bracket hole size models are available. CARBING oil catch tank interior design has oil separator. Longer inlet pipe improves oil-gas separation. Drain bolt for easy oil dumping is one of the standard features for CARBING oil catch tank. It is also equipped with oil level gage. Hoses are tough heat resistant, oil resistant and bend resistant bladed hose to accommodate use in high temperature Engine room. Please check your vehicle hose size for fitment Avoid installing in the location where high temperature is present such as near exhaust manifold or turbo unit. Check the oil level inside Oil Catch tank periodically. Drain oil inside the tank if you find oil level above 1/2 the tank. Separator : This Separator separates blow by gas and sludge, carbon etc. unwanted contaminants inside Blow by gas line. Level Gage : You can Visually check Oil level inside tank. Oil Drain bolt : It is easy to drain oil by loosening the oil drain bolt. 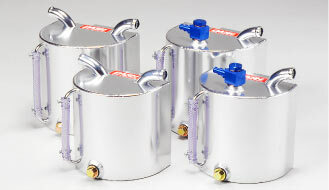 Only Type Oil Catch Tank"
Carbing Oil catch tank is available in two sizes for competition use in mind. 2 Litter type for up to 2000cc Engine and 3 Litter type for up to 3000cc types to best suit your need. In order to retrofit variety of vehicles, we have designed 3 in one type (10, 12, 16mm dia.) 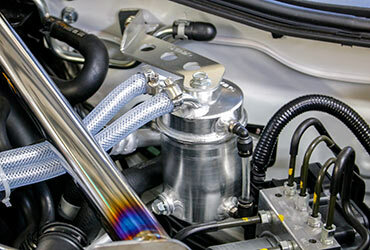 hose inlet and 20mm Diameter inlet pipe to accommodate variety of vehicle applications. 3 in one type neck designed to turn 360 degrees for more flexible installation applications. 2 litter type. Up to 2000cc engine. 3 litter type Up to 3000 cc engine. 2L 160 110 165 2 litter type. Up to 2000cc engine. 3L 180 125 175 3 litter type Up to 3000 cc engine. Avoid installing in the location where high temperature is present such as near exhaust manifold or turbo unit. Check the level regularly and dump excess oil when oil level reach about 1/2 the tank. Consult with professional installer when your vehicle have more than one blow-by pipe or equipped with one-way valve.